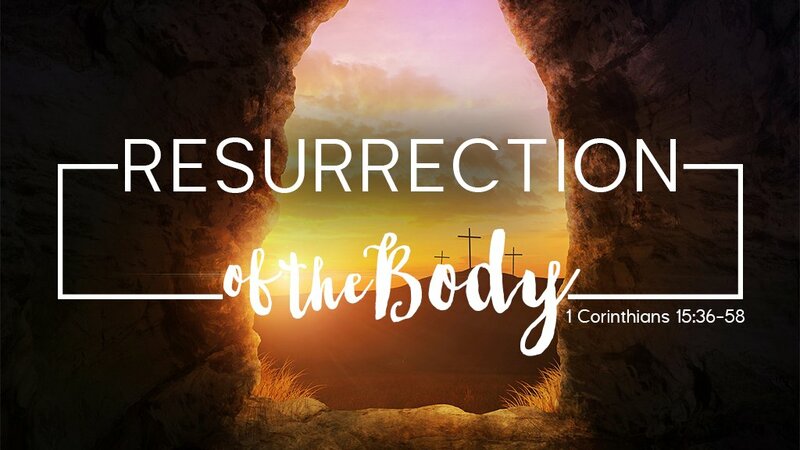 Resurrection of the Body 1 Corinthians 15:35-58 I. Analogies of Resurrection; 15:35-44. 35 But someone may ask, "How are the dead raised? With what kind of body will they come?" 36 How foolish! What you sow does not come to life unless it dies. 37 When you sow, you do not plant the body that will be, but just a seed, perhaps of wheat or of something else. 38 But God gives it a body as he has determined, and to each kind of seed he gives its own body. 39 All flesh is not the same: Men have one kind of flesh, animals have another, birds another and fish another. 40 There are also heavenly bodies and there are earthly bodies; but the splendor of the heavenly bodies is one kind, and the splendor of the earthly bodies is another. 41 The sun has one kind of splendor, the moon another and the stars another; and star differs from star in splendor. 42 So will it be with the resurrection of the dead. The body that is sown is perishable, it is raised imperishable; 43 it is sown in dishonor, it is raised in glory; it is sown in weakness, it is raised in power; 44 it is sown a natural body, it is raised a spiritual body. If there is a natural body, there is also a spiritual body. In their denial of the resurrection it was the assumption that it had to do with reanimating corpses. Therefore, because they could not figure out how, they had given up the resurrection itself. Paul calls them foolish, because they have not considered what God can do. The first analogy Paul uses to help them understand the resurrection is that of a seed and a plant. By being buried in the ground, the seed seemingly dies. Yet out of its death as a seed, new life emerges, totally different in appearance from the seed. Yet, somehow a mature plant remains the same living entity. There still lies ahead for the Corinthians resurrected bodies that will be far more glorious than their present ones. Unlike their current bodies, these new bodies will be created for eternity, never again to die or limited be sin or weakness. II. Adam and Christ, 15:45-49. 45 So it is written: "The first man Adam became a living being"; the last Adam, a life-giving spirit. 46 The spiritual did not come first, but the natural, and after that the spiritual. 47 The first man was of the dust of the earth, the second man from heaven. 48 As was the earthly man, so are those who are of the earth; and as is the man from heaven, so also are those who are of heaven. 49 And just as we have borne the likeness of the earthly man, so shall we bear the likeness of the man from heaven. Believers who have shared in the limited, fallen likeness of Adam can look forward to sharing in the kind of perfect humanity Jesus embodies, but only after this life, when Jesus comes back again. A new body is a necessity for experiencing the world to come. III. Assurance of Transformation; 15:50-58. 50 I declare to you, brothers, that flesh and blood cannot inherit the kingdom of God, nor does the perishable inherit the imperishable. 51 Listen, I tell you a mystery: We will not all sleep, but we will all be changed-- 52 in a flash, in the twinkling of an eye, at the last trumpet. For the trumpet will sound, the dead will be raised imperishable, and we will be changed. 53 For the perishable must clothe itself with the imperishable, and the mortal with immortality. 54 When the perishable has been clothed with the imperishable, and the mortal with immortality, then the saying that is written will come true: "Death has been swallowed up in victory." 55 "Where, O death, is your victory? Where, O death, is your sting?" 56 The sting of death is sin, and the power of sin is the law. 57 But thanks be to God! He gives us the victory through our Lord Jesus Christ. 58 Therefore, my dear brothers, stand firm. Let nothing move you. Always give yourselves fully to the work of the Lord, because you know that your labor in the Lord is not in vain. Frail, human bodies cannot survive in God’s eternal and holy presence. One must have a body that is imperishable and immortal. This change will take place instantaneously, not gradually. The climax of these events for believers is the destruction of death itself. Paul reminds us that it is the resurrection hope, and only this hope, that keeps believers from despair and helps them stay faithful in Christian service. Because we will one day fully bear the image of Christ, who is the perfect reflection of God, we should encourage each other to work toward that image even now. Paul ends with a call to “let nothing move you.” This urgency is almost certainly in direct response to the denial of the resurrection by some. 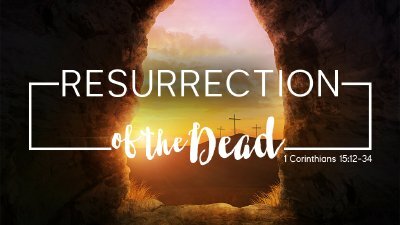 Resurrection of the Dead 1 Corinthians 15:12-34 I. Consequences of No Resurrection; 15:12-19. 12 But if it is preached that Christ has been raised from the dead, how can some of you say that there is no resurrection of the dead? 13 If there is no resurrection of the dead, then not even Christ has been raised. 14 And if Christ has not been raised, our preaching is useless and so is your faith. 15 More than that, we are then found to be false witnesses about God, for we have testified about God that he raised Christ from the dead. But he did not raise him if in fact the dead are not raised. 16 For if the dead are not raised, then Christ has not been raised either. 17 And if Christ has not been raised, your faith is futile; you are still in your sins. 18 Then those also who have fallen asleep in Christ are lost. 19 If only for this life we have hope in Christ, we are to be pitied more than all men. If there is no future bodily resurrection of all Christians, then Jesus Himself was not bodily raised, and that makes Christianity pointless. Paul does not permit a perspective on Jesus that views Him merely as a good, moral teacher. If Christ was not raised, death is not conquered. II. The Resurrection Brings the Defeat of Death; 15:20-28. 20 But Christ has indeed been raised from the dead, the firstfruits of those who have fallen asleep. 21 For since death came through a man, the resurrection of the dead comes also through a man. 22 For as in Adam all die, so in Christ all will be made alive. 23 But each in his own turn: Christ, the firstfruits; then, when he comes, those who belong to him. 24 Then the end will come, when he hands over the kingdom to God the Father after he has destroyed all dominion, authority and power. 25 For he must reign until he has put all his enemies under his feet. 26 The last enemy to be destroyed is death. 27 For he "has put everything under his feet." Now when it says that "everything" has been put under him, it is clear that this does not include God himself, who put everything under Christ. 28 When he has done this, then the Son himself will be made subject to him who put everything under him, so that God may be all in all. But wonderfully Christ has been raised bodily and has set into motion a chain of events that will culminate in the universal demonstration of the sovereignty of God. Christ's physical resurrection guarantees the future physical resurrection of all believers. This life is not all that there is, nor is life after death simply immortality of the soul. Paul points out the parallel between Adam's sin leading to the sinfulness of all humanity, and Christ's resurrection leading to the resurrection of all His followers. After some unspecified time, the end of human history will arrive. By then, Christ will have destroyed all opposition to His reign in the universe, both human and demonic. Finally, death itself will be destroyed, so that God's people will never again have anything to fear for all eternity. But the last word is not Christ's, but God's. III. Further Consequences of No Resurrection; 15:29-34. 29 Now if there is no resurrection, what will those do who are baptized for the dead? If the dead are not raised at all, why are people baptized for them? 30 And as for us, why do we endanger ourselves every hour? 31 I die every day-- I mean that, brothers-- just as surely as I glory over you in Christ Jesus our Lord. 32 If I fought wild beasts in Ephesus for merely human reasons, what have I gained? If the dead are not raised, "Let us eat and drink, for tomorrow we die." 33 Do not be misled: "Bad company corrupts good character." 34 Come back to your senses as you ought, and stop sinning; for there are some who are ignorant of God-- I say this to your shame. Some of the Corinthians, along with all their other problems, were baptizing people on behalf of unbaptized, deceased believers or others. Paul is in no way condoning the practice. There is no evidence that Christians ever considered proxy baptism valid. What is more, no Scripture ever suggests that salvation is transferable from one individual to another apart from their personal belief in this life. Our persistent sinful nature continues to try to corrupt us when we are surrounded by people engaged in sinful practices. Unless we take deliberate, conscious action to the contrary immorality often flows from false theology. Popular culture and media have a fascination with life after death and near-death experiences. This fascination for the afterlife resembles more the Corinthians' false teaching than true Christianity. Seldom are persons depicted as having fully human bodies in their next life. Virtually never are the destinies of Christians and non-Christians biblically distinguished. Either all people are going to heaven, or else they are distinguished based on how good or bad they were during their time on earth. Let’s not be those ignorant of God to our shame. 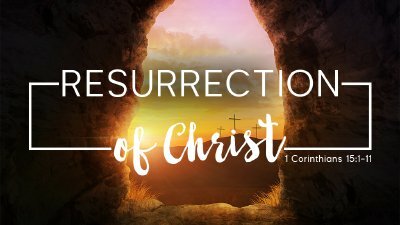 Resurrection of Christ 1 Corinthians 15:1-11 I. The gospel is built on the resurrection of Jesus; 15:1-2. 1 Now, brothers, I want to remind you of the gospel I preached to you, which you received and on which you have taken your stand. 2 By this gospel you are saved, if you hold firmly to the word I preached to you. Otherwise, you have believed in vain. Paul warns not to deviate from the gospel based on the resurrection of Jesus. Believing another gospel is no belief that leads to salvation. Believers remain under the power of sin and death.  The resurrection brings us to the very center of the Christian faith. Christ's death and resurrection are inseparable. Christian belief without the doctrine of bodily resurrection proves worthless. II. The resurrection defines the gospel; 15:3-4. 3 For what I received I passed on to you as of first importance: that Christ died for our sins according to the Scriptures, 4 that he was buried, that he was raised on the third day according to the Scriptures, Paul reminds the Corinthians what they should have remembered. Christ died for our sins according to the Scriptures, that he was buried, that he was raised on the third day according to the Scriptures. Jesus himself interpreted his death and resurrection in terms of the Scriptures. This is the gospel message. If there is no resurrection of Jesus, there is no gospel and no salvation. III. The resurrection is historical fact; 15:5-8. 5 and that he appeared to Peter, and then to the Twelve. 6 After that, he appeared to more than five hundred of the brothers at the same time, most of whom are still living, though some have fallen asleep. 7 Then he appeared to James, then to all the apostles, 8 and last of all he appeared to me also, as to one abnormally born. Paul lists witnesses to Christ’s resurrection in what appears to be a chronological order. Paul mentions that most of the five hundred were alive at the time of his writing implies a known group rather than five hundred anonymous witnesses. Unlike the Twelve, who participated in the ministry of Jesus, Paul’s call to apostleship came suddenly and unexpectedly. As an unbeliever and persecutor of the church, Paul was in a condition of spiritual death. We are reminded of what must remain central doctrine even for mature believers, tempted to move away to peripheral matters. The resurrection of Jesus is an historical fact not just a spiritual parable. IV. The resurrection is the ultimate act of grace; 15:9-10. 9 For I am the least of the apostles and do not even deserve to be called an apostle, because I persecuted the church of God. 10 But by the grace of God I am what I am, and his grace to me was not without effect. No, I worked harder than all of them-- yet not I, but the grace of God that was with me. Paul acknowledges his inferiority as an apostle because he had persecuted the first Christians. This weakness is turned into an opportunity to magnify God's grace. Grace led to greater effort and substantial accomplishment, through God’s continual grace at work. God's mercy produces more diligent effort on Paul's part. Paul’s autobiographical statements about his conversion describe God’s gracious call, the righteousness that comes only by faith, and God’s mercy as a pattern for all who will believe on Jesus Christ for eternal life. It is by God’s grace, empowered by the resurrection, through faith that we are who we are as followers of Christ and children of God. It is overwhelming to ponder what God can do through us when we are saved by grace and live in grace, empowered by the resurrection of Jesus the Christ. IV. The resurrection is evidenced as it is shared and believed; 15:11. 11 Whether, then, it was I or they, this is what we preach, and this is what you believed. There is only one true gospel, whoever may preach it. All gospel preaching proclaims the resurrection of Christ as a core component; otherwise, there is no gospel. To believe any other gospel is to “believe in vain.” Christianity lives or dies with the claim of Christ's resurrection. Christians must appeal to more than a personal testimony, they must recognize the historical evidence that is on their side.